The river Serga is the most attractive rivers of Middle Urals and rafting along it is the most appropriate variant for Trnssib travellers. The organizer provides: equipment (catamarans or boats, tents, sleeping bags etc. ), a guide, transfer. Caves «Druzhba» ("Friendship") and Arakaevskaya and karst formations “the Big Failure”, hiking in the territory of nature park, paintings on the rock “Pisanitsa”. At picturesque spots, there are breaks for a swim and coffee, and in the evening a rest by an open fire. Board provided by the organizer (breakfast, lunch & dinner). Russian cuisine. Transport (car, minibus) from Ekaterinburg to the bank of the river Serga is provided by the organizer. 130 km from Ekaterinburg. It takes 2 hours to get point of start. Transfer by bus to the town Nizhnie Sergi (100 km from the Ekaterinburg), situated near the river Serga. 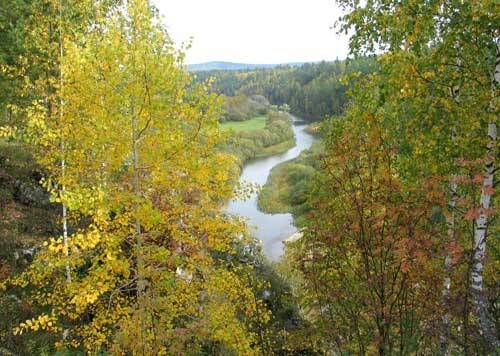 This part of tour takes place on the territory of the Nature Park “Deer Streams”. The park was opened on October 29th, 1999. It is situated 100 km to the south west of Ekaterinburg in Nizhnie Sergi. Located in the park is the settlement "Bazhukovo". The park covers an area of 12,700 hectares along the valley of the river Serga from Nizhnie Sergi up to the village Arakaevo. The picturesque valley of the river Serga works its way through calcareous rocks and it abounds in various manifestations of karst. The park contains the largest cave of the Sverdlovsk district - cave «Druzhba» ("Friendship") and also other famous caves - Arakaevskaya, Katnikovskaya and karst formations “the Big Failure” and the Glacier. The nature park represents a border between landscapes of middle Ural mountain taiga of the Sredneuralsk area and forest-steppe of the Krasnoufimsk region. This landscape variety, low level of industrial pollution and economic development of the territory of Nizhnie Sergi area give the possibility to keep numerous species of flora and fauna. Coniferous and broad-leaved forests prevail in the park. Numerous archeological finds and objects testify that from most ancient times primitive men occupied the valley of the river Serga. Paintings on the rock “Pisanitsa” have become popular attractions – among the 22 natural monuments found in the park. Relief of the area is characteristic for the middle Urals with average heights of 300-500 m above sea level. The rocks “ostantsy” along the banks of the river Serga, reaching heights of 40m are of great interest for park visitors. The park is characterized by deep river valleys with steep cliffs, tributaries of the Serga, whose valley has a width of up to 250-300 metres and for the most part is a classical “V” shape. The karst is the phenomenon widely distributed in this area. Here it is possible to see various karstic forms of a relief. All typical species of taiga fauna abound here. In the upper reaches of the river and its tributaries beaver settlements are widely distributed. The largest colonies of bats in the middle Urals - wintering in the caves are unique. In the Serga and its tributaries, all species of fish, characteristic for the mountain taiga zone of the middle Urals live - including grayling. The climate all year round is quite comfortable for both active tourism and sightseeing. Preparing of catamarans and beginning of rafting along the river Serga. Spend the night in the double tents. Walk to the rock (the Kamien) “Karst bridge” with a grotto in its central part. From the top of “Karst bridge” the majestic panorama of the river valley opens. On its slopes the several rare and disappearing species of plants grow. In the beginning of June one can see the flower with a violet nimbus and yellow central part, which looks like camomile. It is an aster Alpine - a wild ancestor of cultural asters. Later the cornflower coal - a large pink flower with wide carved leaves blossoms. In the world there are a few places where it is possible to meet these species. Walk along the river Serga. The Kamien "Drowned man" with panoramic platform on its top, from which the picturesque kind on a valley of the river Serga opens. Karst crater «Kissing stones», named so because its walls look like two human faces inverted to each other. The Kravtsov’s bridge. Crossing it, you get from the light mixed wood at coniferous taiga where other smells, other plants and, it seems, air - too another. The small viewing platform, whence the Kamien Dyrovatyj, one of the most popular place on the river Serga, is perfectly seen. Nearby this place there is a big grotto. Archeologists found the site of primitive people and bones of the dyed out animals in it. Visit the cave Druzhba (“Friendship”) and the Big and Small Failures. The cave’s entrance is big (6 x 4m) and situated about 10 meters above the stream. In the cave there are underground streams and lakes, ice formations. In the cave there are few grottos – the grotto Baranovskogo, the grotto of the Meeting of cave explorers, the grotto “Etazherka”, a grotto of Recruits and complex three-storied labyrinth “Etazherka”. The Big and Small Failures. The Big Failure is big 40 m depth karst crater, one of the deepest failures on the Urals. It is probably that it was formed in result of collapse of a huge cave. The failure has oval shape and extends from northeast towards southwest. It is possible to go downwards, using a metal ladder. At the bottom there are the lateral courses filled by beautiful ice stalactites and snow even in summer. Besides the snow and ice are kept within summer at the bottom of the failure. Near the Big Failure there is other geomorphologic monument of Nature - Small 30 m depth Karst Failure "Druzhbinskij». There is original karst bridge in the middle part of it. Accommodation in tent camp. Russian Bath. On the way to Ekaterinburg we will stop near the obelisk marking the boundary of Europe and Asia. We will visit the geographical margin between Europe and Asia, examine the frontier obelisk “Europe – Asia” on the old big Siberian tract, which is a landmark and historical monument.